Tucked away in the hills of Pennsylvania is the little town of White Haven. It’s located on the Lehigh River, home to just over 1,000 residents. 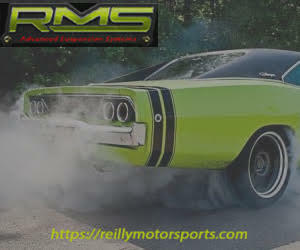 To many people it’s just another small town in rural America but to Mopar enthusiasts here lies a shop that has forever changed the drivability of our classic cars, Reilly Motorsports. 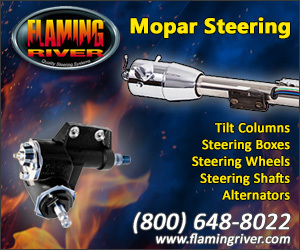 If you’re not familiar with Reilly Motorsports (RMS), they produce bolt-in suspension kits for classic Mopars. Their kits are designed for straight line and handling performance. We were able to spend a day with owner Bill Reilly, who guided us through the shop, showed how parts are made, shared the history of RMS and check out his personal collection of Mopars. As we arrived we were greeted by Bill’s two golden retrievers, Lucy and Bailey. They can be found at the shop daily and are sometimes joined by a St. Bernard named Minnie and a Pomeranian mix named Trixie. 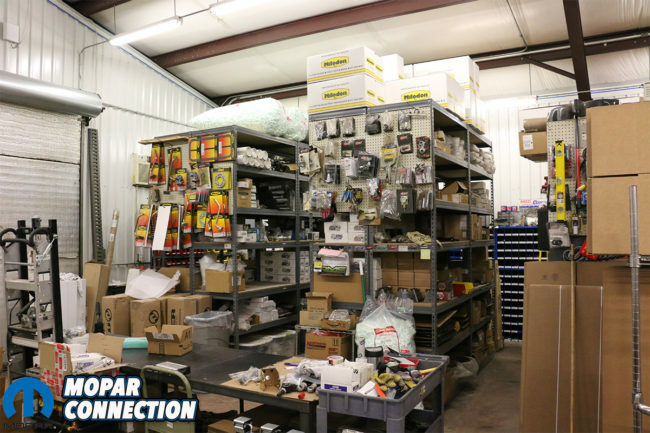 Once we stepped inside, it was like home, except bigger, with better parts lying on the shelves and endless capabilities. Part of our trip was that we had brought along Project Orange Crush for some needed upgrades. We have been using his suspension for a few years now but didn’t know much of the history of Reilly Motorsports. We took some time to sit with Bill and chat about his journey. 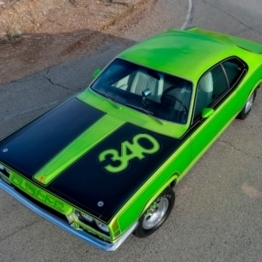 In the mid ’90s Bill completed the restoration of his 1969 Dodge Dart. 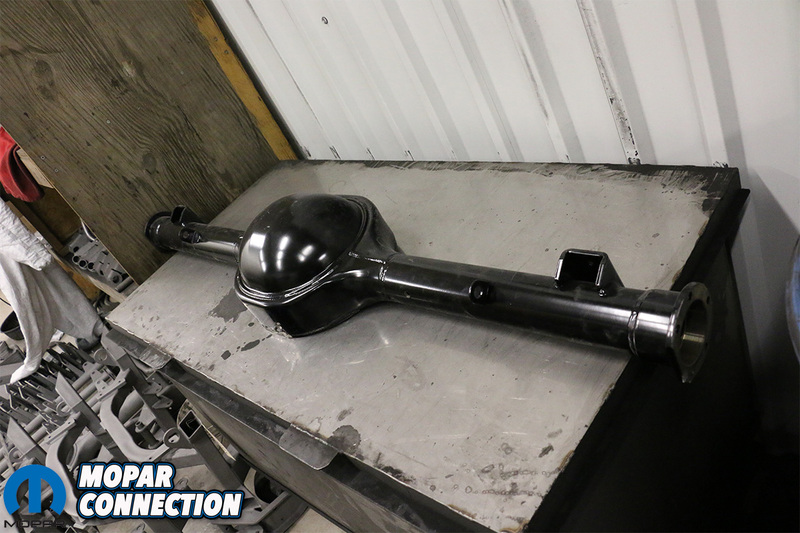 Along with a stout 440, Bill also did a lot of the typical stock upgrades like T-bars, a sway bar, poly bushings, good shocks, etc. “After all that, I still thought it drove like crap. It was OK, but even back then my ’94 Dodge truck was much nicer riding, more predictable and more precise to drive. 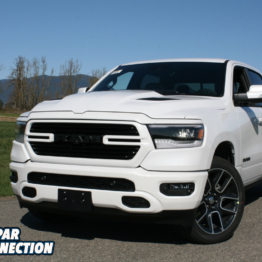 I was disappointed that the Dart, after all that work and upgrading, didn’t even drive as nice as a newer pickup truck,” stated Bill. This fueled the fire that eventually evolved into what is known as Reilly Motorsports. 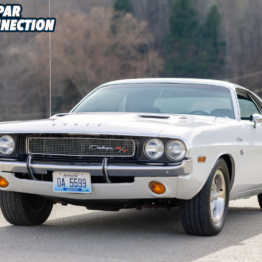 “What fun is it to drive a great handling car to work every day and then spend the weekends with white knuckles dealing with poor brakes, sloppy steering, and a bone jarring ride? You can somewhat fix these problems with stock upgrades, but you’ll never come close to modern drivability with the stock design?” Bill asked. 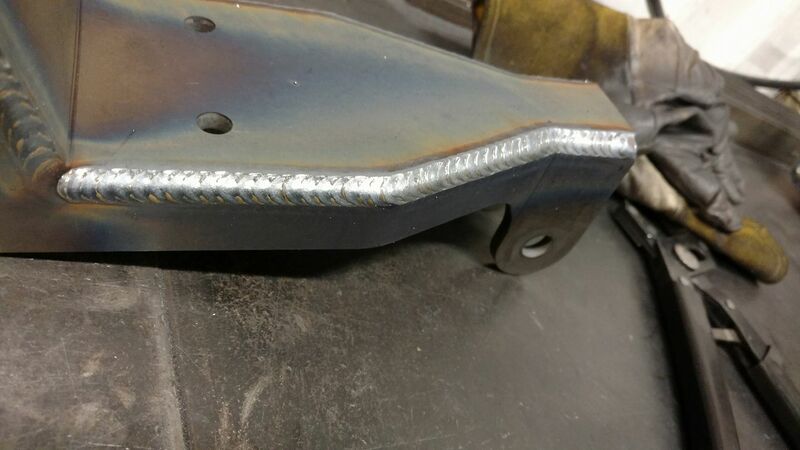 Bill was already an accomplished fabricator and designer by trade, and decided to find a way to make his Dart handle as good as his ’94 Dodge Truck. The result was a tubular K-member with rack and pinion steering, tubular A-arms and coil-overs that bolted directly to the factory front. 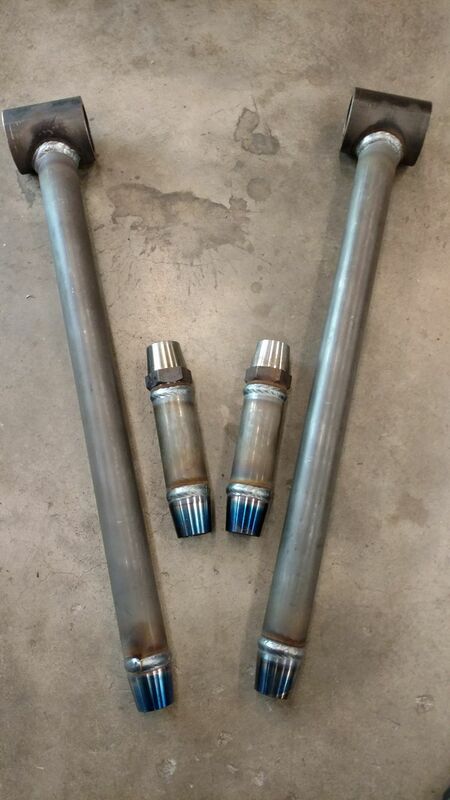 In the rear, Bill did away with the leaf springs and designed a triangulated 4-link setup that allowed for factory gas tank and full exhaust. The complete suspension was definitely more predictable and outperformed his Dodge truck by ten fold. 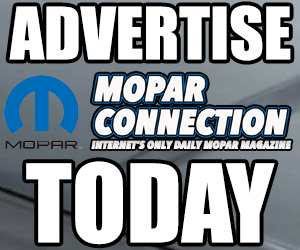 He took a chance that other enthusiasts shared his interest of creating a better handling Mopar and started Reilly Motorsports (RMS) in 1999. Bill was immediately overwhelmed with the response to his newly designed bolt-in suspension. RMS started in Bill’s backyard and still resides there today. 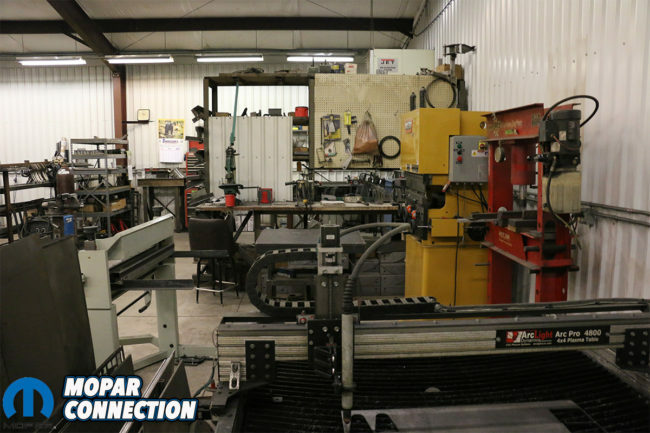 Since 1999, he has made a few upgrades and added on to his shop as the business has grown. He keeps a small close-knit team of just a few people. Bill has made a few improvements to his original design and as the aftermarket continues to create better parts, Bill continues to improve his suspension. Over the years, he has adapted the design to work for multiple A, B and E-bodies with the ability to use any motor configuration. He has even designed a few stock replacement parts to help cure some alignment issues and road wandering that stock suspensions are known for. 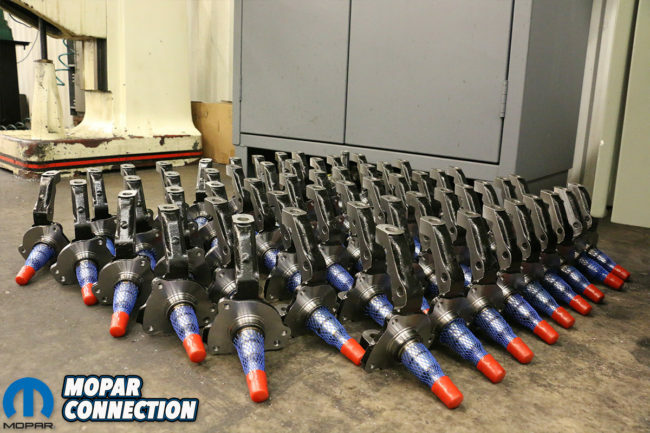 Although he has made a living from building suspensions, he does it because he wants to make customers happy and get them to enjoy driving their car. “I’m most excited when a customer calls to thank me for making their car fun to drive again. That’s more rewarding to me than anything else,” exclaims Bill. 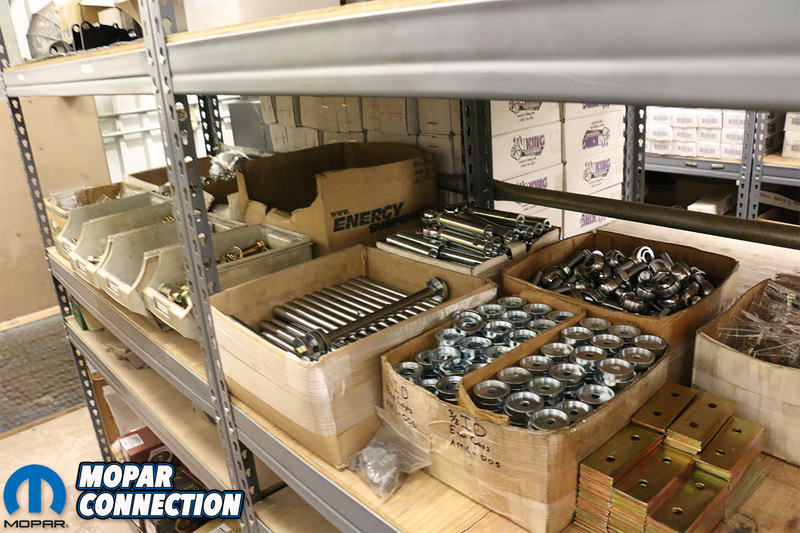 Above: You can see how the shelves are packed full of parts ready to ship and a few of the suspension components that have been welded up. After talking with Bill about the history of RMS, he showed us around. 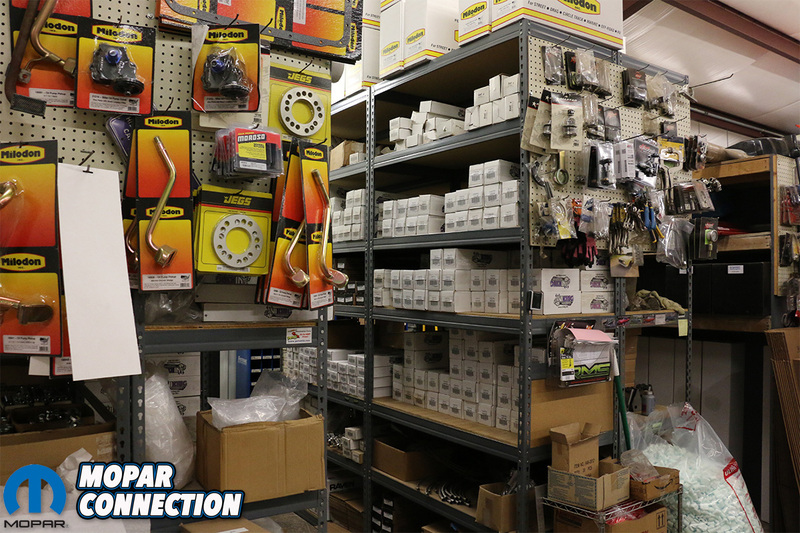 We started in the main building which houses the inventory of parts and office. Bill tries to keep a good stock of inventory of all the parts listed on the website on hand at all times to provide quick shipping for customers. 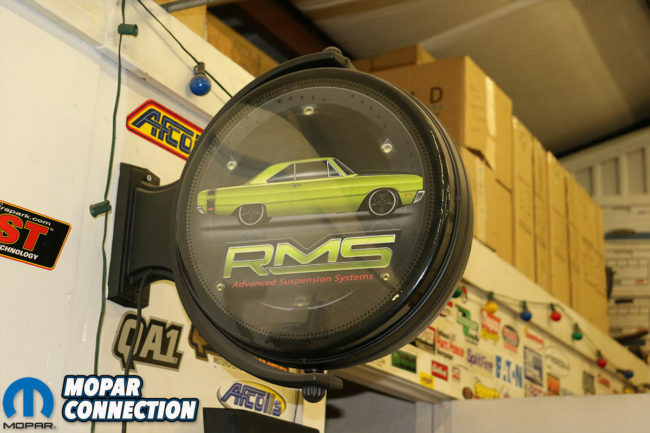 Although suspension kits take some time to build due to each one being individually designed depending on the needs of the customer. 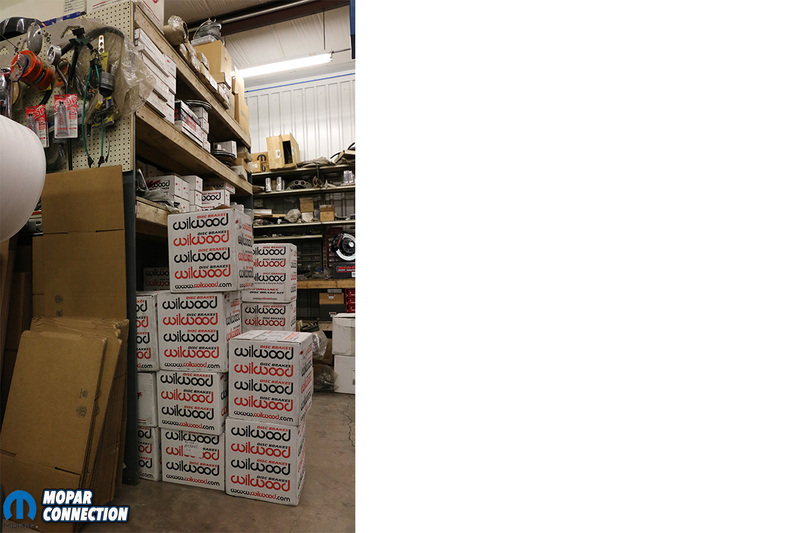 Bill had shelves full of Flaming River Industries’ racks, Wilwood brakes, Milodon oil pans and all sorts of other goodies. Just past the selves of parts sits a couple of lifts. Bill uses them to work on some customers cars but mainly for his fleet of cars. Bill explained that the lifts are a new addition and that before now, he had used blocks and jacks to install and make suspension adjustments. 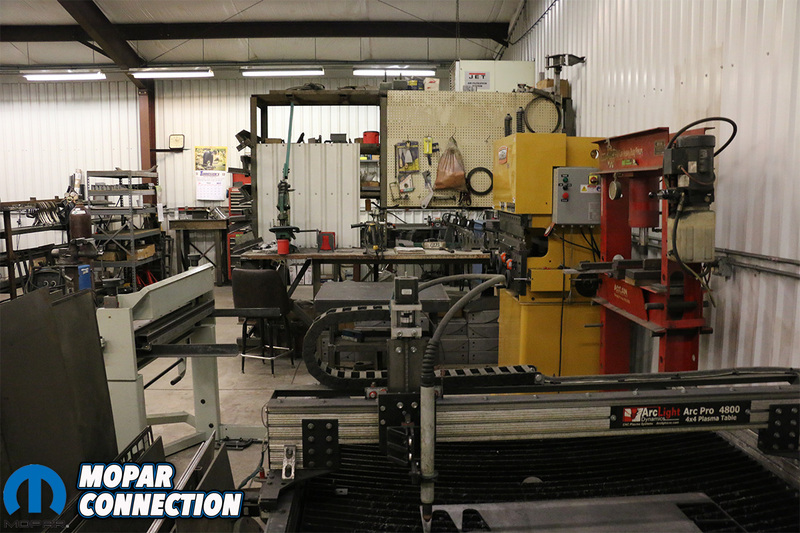 Bill choose to have two different lifts installed in the shop. The first is a standard two-post lift that makes working on most of the car relatively easy. The other is a platform scissor lift. 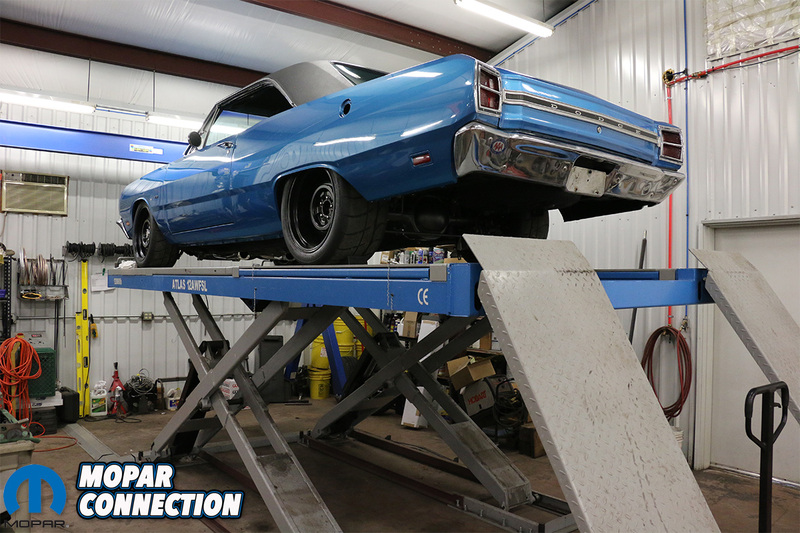 You can still work on cars while on this lift, but he uses it mostly for suspension tuning that requires the suspension to be loaded. Also all the parts for the suspension kits are hand-welded in this area. 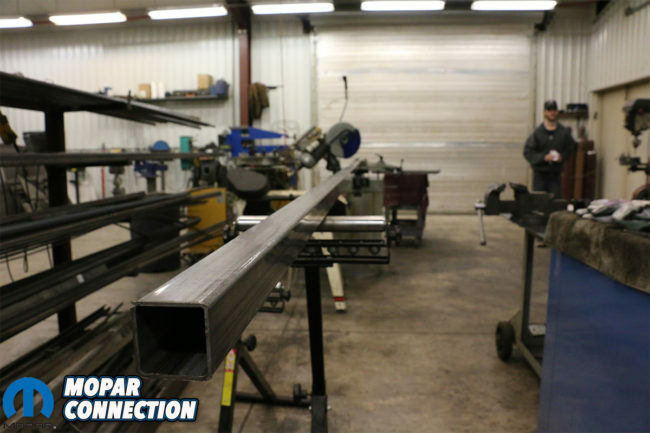 Every control arm, K-member, link bars, etc are built in-house, not imported from who-knows-where with unknown quality of welds and material. Above: It might look like a small space but the capabilities are endless. 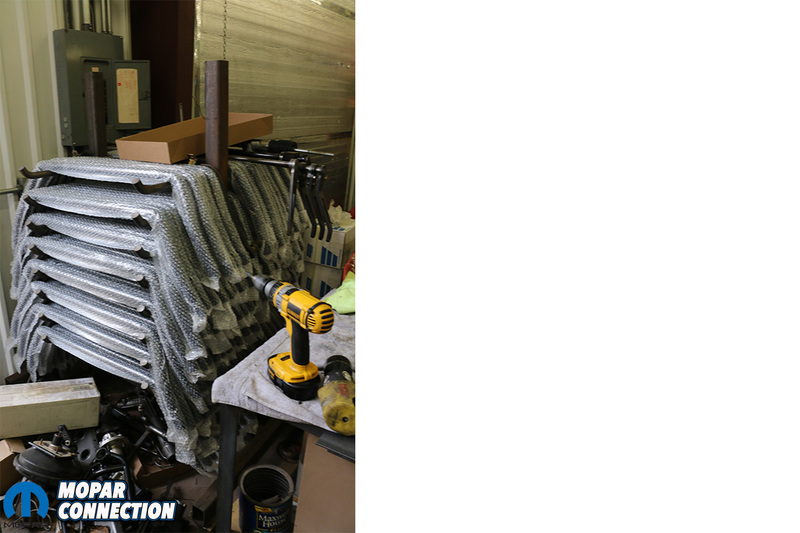 You can see the plasma table at work and multiple parts ready for assembly. Once we were done in the main building, we stepped into the second building. 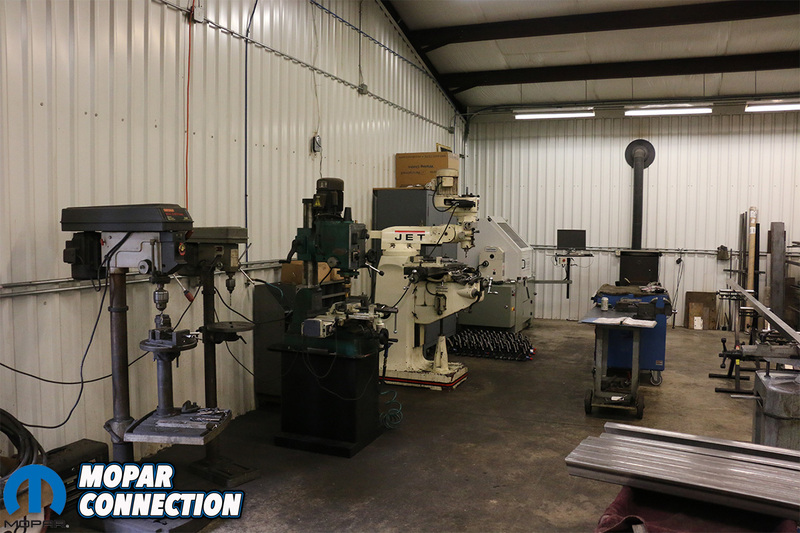 Here is sectioned off into two separate parts; the first section houses a pair of drill presses, a mill, a CNC lathe, metal saws and their newest addition, a plasma table. 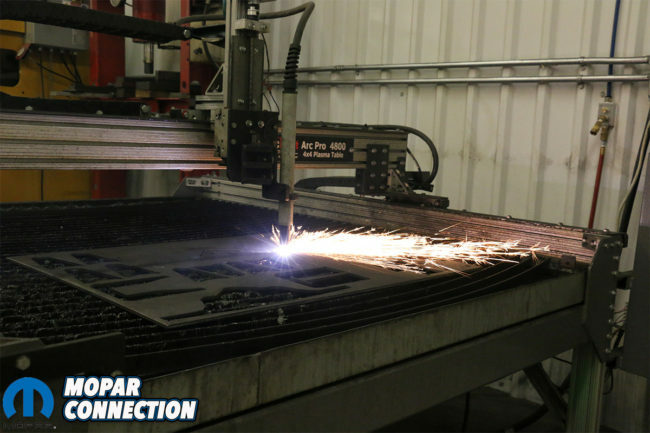 They are very excited about the plasma table as it has cut down production time for certain parts that used to be done by hand. They have also been able to find uses in cutting adapter plates and creating other unique pieces that would be too time consuming to try before. This room also holds majority of the metal stock that’s used to build the links, crossmebers, A-arms, etc. 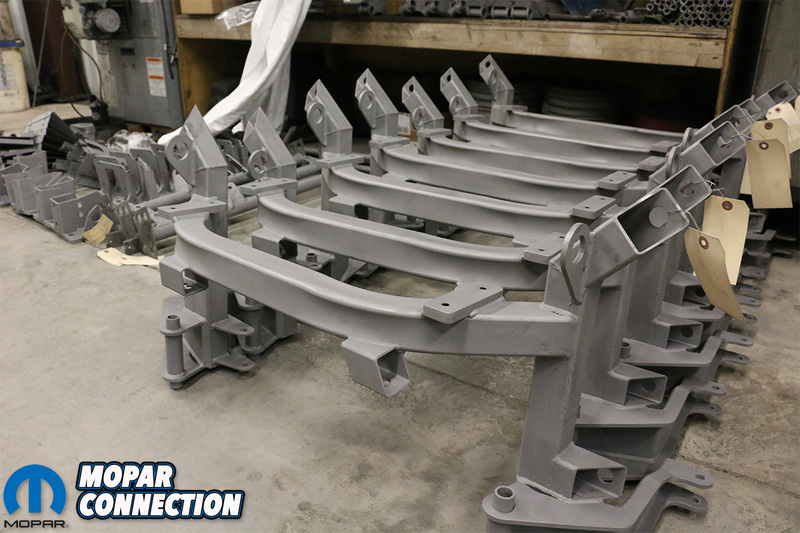 The next room is where all the parts are sandblasted and then powder coated. I talked with Bill about why he didn’t contract out the power coating and he told me that the person he was using started to lack in quality. 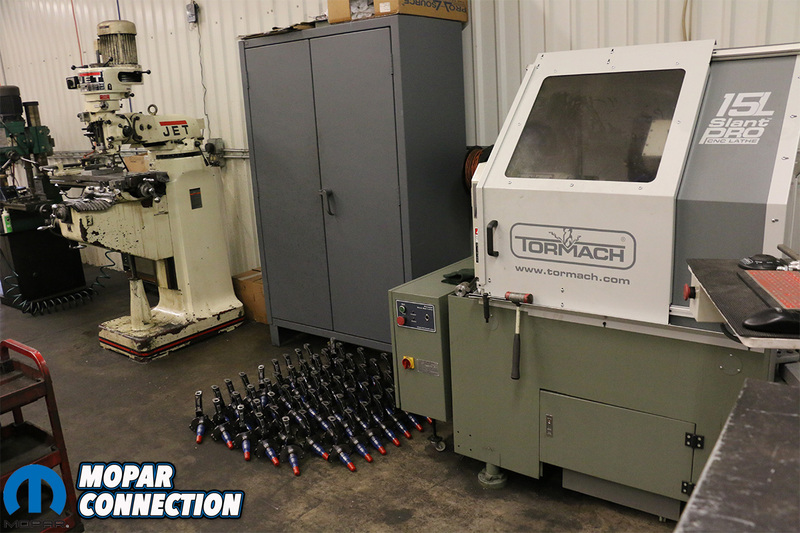 “When a part is shipped out it has my named stamped on it and if quality is lacking whether its fault of my own or not, it still reflects poorly on me and the guys here at the shop,” Bill stated. We could tell Bill was passionate about not only building performance suspensions but making sure that every part is quality built and will withstand the demands of racers and street driven cars. Above Left: The car that started it all, the green 1969 Dodge Dart. 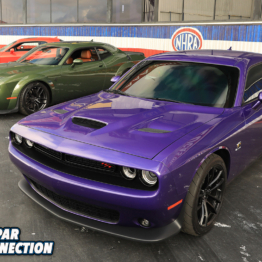 Above Right: The new blue 1969 Dart will take place of the green one and be the shop guinea pig from now on. We had some time to spare before we had to get to work on Project Orange Crush, so Bill took us up to his garage where he keeps his collection of cars. 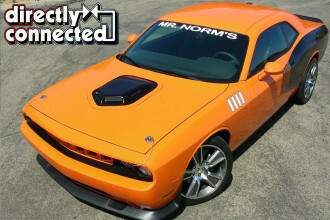 Bill has been a Mopar fan sine he was a kid and unlike some shops, Bill does own multiple Mopars. 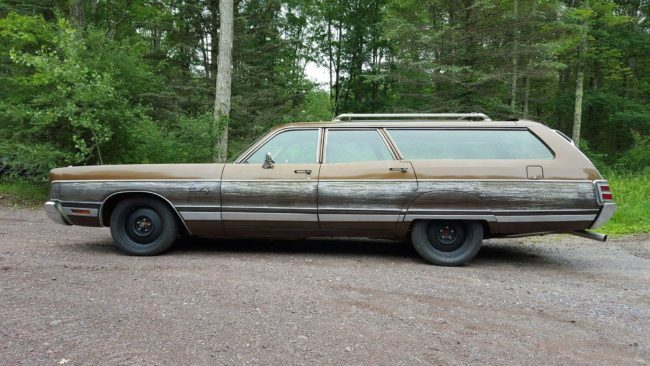 Bill has collected a wide range of Mopars, including two 1969 Dodge Darts, 1970 Challenger, 1968 Coronet, and a 1973 Chrysler Town & Country wagon. Many of you have probably seen his 1969 Green Dart. That car never ceases to amaze us every time we see it. It was the first car that Bill built and what gave RMS its beginning. It’s a pretty radical build with no back seat and a lot of custom touches. 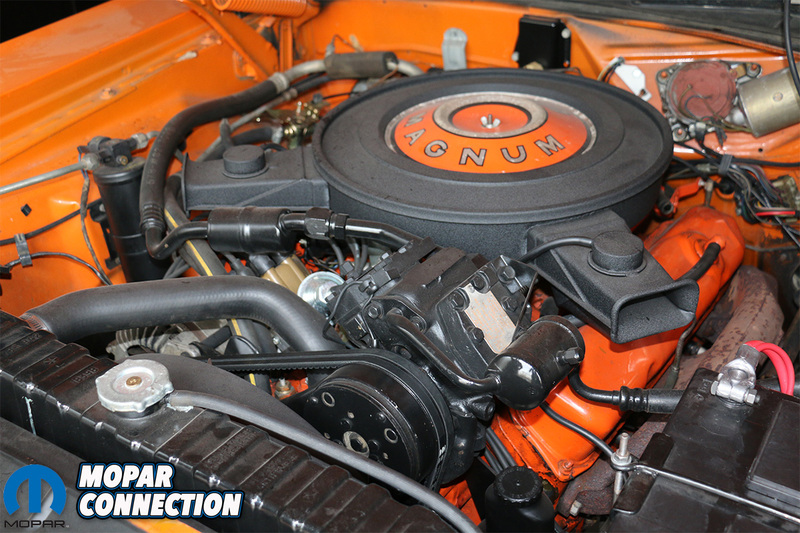 It started out with a 440 under the hood, but now sits a Ray Barton 528 Hemi pushing out 707 ponies. 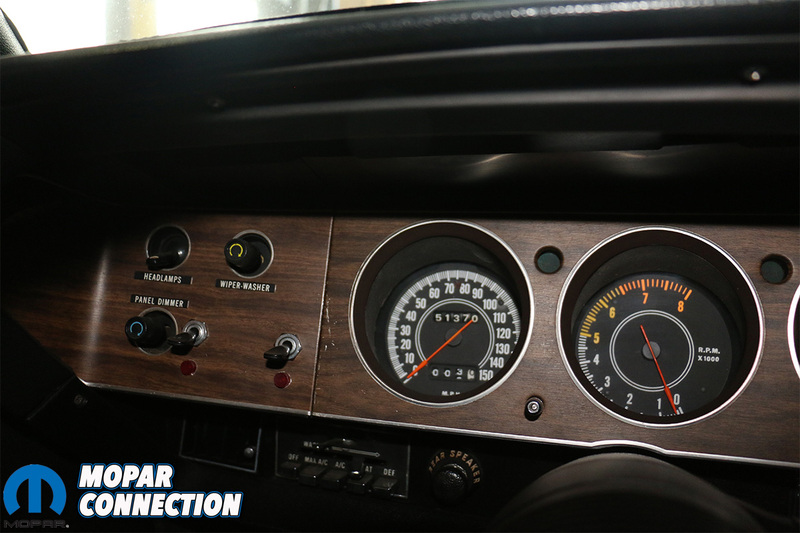 Bill is happy how the car is setup and is retiring it from being the shops test car – noting that he has started on a second 1969 Dart. 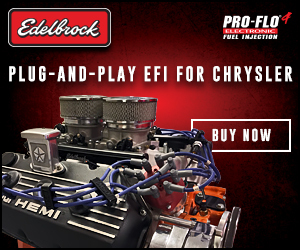 This one is going to be powered by a wild stroker small block. He plans to keep this car very stock looking but with all of his suspension upgrades and more. The car is close to being finished. 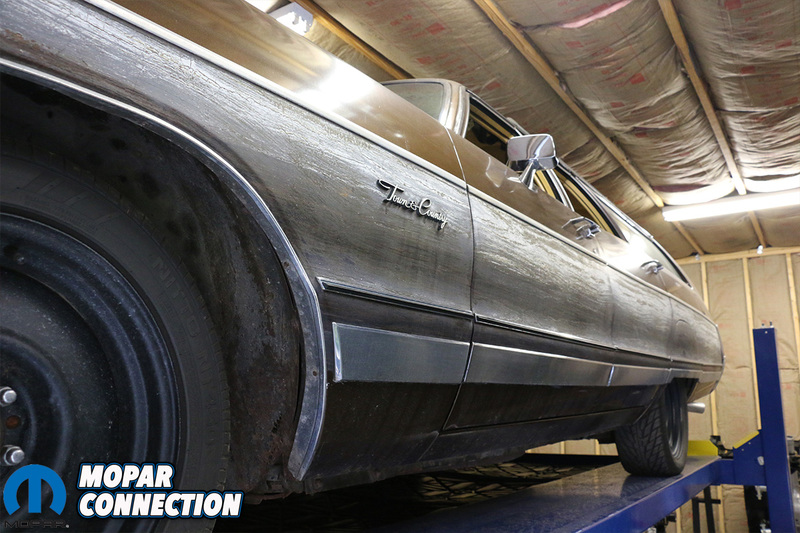 He also is in the process of building a 1968 Dodge Coronet 500 convertible with a 500 stroker pushing 700ft/lbs. of tire frying torque. The car was not back from paint yet and didn’t get to check it out. 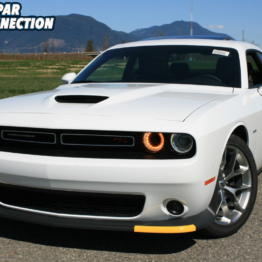 Above: The originality of the Challenger is incredible to see, pictures don’t do it justice. Bill keeps it tucked away in his personal garage for safe keeping. Supposedly, both the cars were used at a dealership as floor models before the ’70 models were available. Bill went to look at the car and couldn’t pass it up. “It’s far more car than I really needed, but after seeing it just couldn’t pass it up. 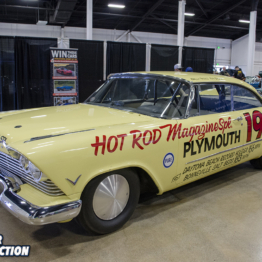 A true original paint survivor doesn’t come along very often, especially a 50,000 mile RT/SE.” Bill told us. 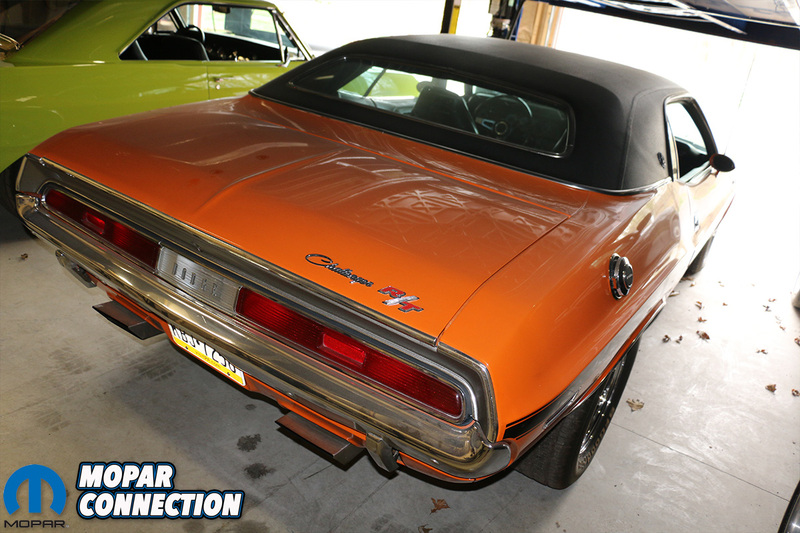 We can attest, the car is in impeccable condition and can see why Bill didn’t pass up the opportunity to own it. Bill said he will be adding some of his components, and drive the car some and use it for some measuring. But don’t worry, Bill ensured us that anything he touches can be unbolted and the original parts reinstalled, which he will be setting aside. Above: Although Bill showed us a few incredible cars, you can tell he loves this just as much or maybe more. He continued, “We only went two blocks before a police car saw us. At the time, pulling over seemed to be the sissy thing to do, so my buddy floored it, which began an hour long ‘Dukes of Hazzard’ style car chase through town and across some of the worst country roads PA could offer. It was easily the best ride of my life and we did get away. Of course being a small town, it only took a few hours for the police to figure out who we were and the they got us the next day. Harsh life lesson learned, thankfully with no injuries. 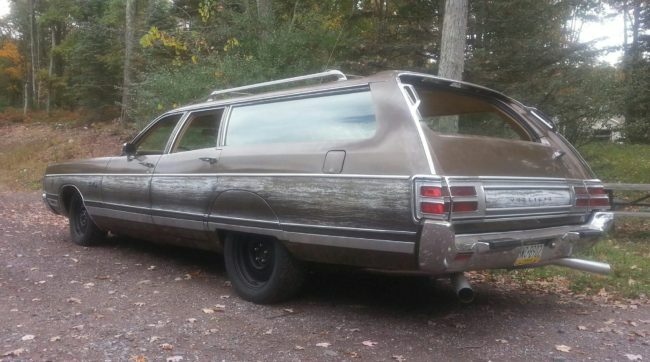 I saw this wagon for sale locally a few years ago, and although not the actual wagon, it’s a twin. I just had to have it.” It made sense now why Bill cherished the wagon so much. 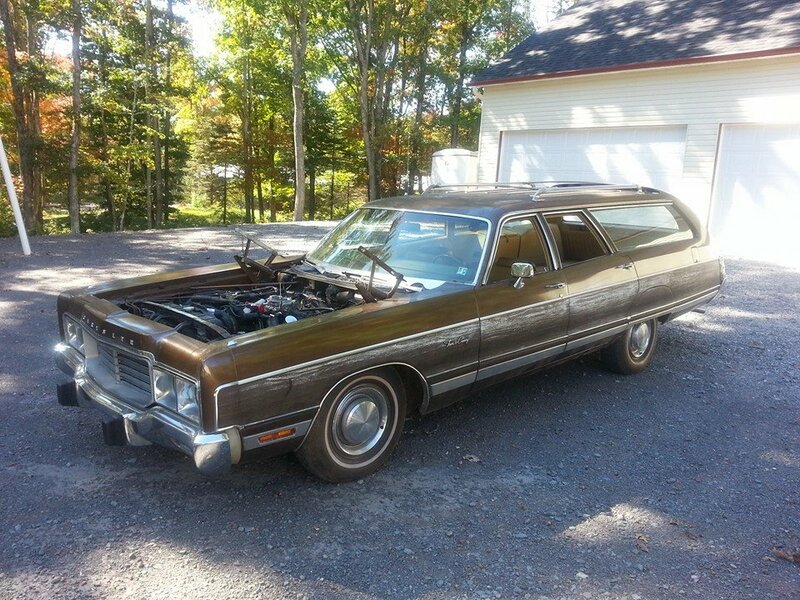 Bill stuffed his old 440 out of his Dart under the hood and loves to drive it around. He says there are no plans of updating the suspension, that there’s satisfaction from driving such a big boat. He did mention that he plans to top the 440 with a 6-71 blower and have it sticking out of the hood. He said he is pretty happy with the fleet of cars he has right now and no plans for any more but that could always change. When we were all done, we asked Bill if there were any big plans in the works for RMS, “As far as the future, technology is always advancing, modern cars drive better every year compared to the last, so we’re always working to make designs behave better, last longer, and look better.” We look forward to seeing more of Bills parts on some killer rides in the future. 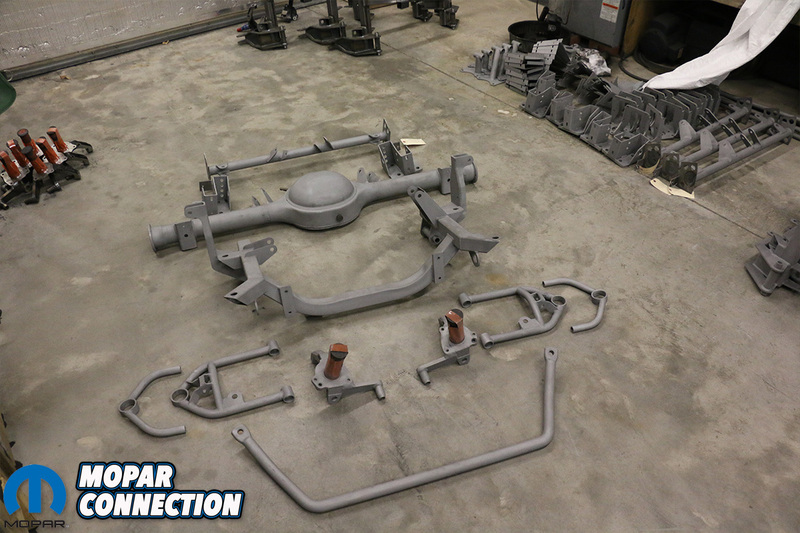 We can’t wait to see what new parts he incorporate into the line of RMS suspension. As for Orange Crush, we will have a complete install and review of upgrading from RMS’s older Street Lynx to their slightly redesigned suspension soon. 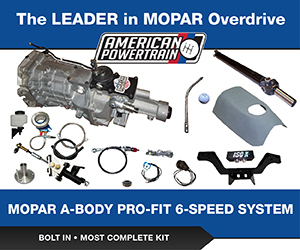 Until then, if you’re looking to get the most out of your classic Mopar and make it drive like a modern car give the guys at RMS a call.